August Creativa event is right around the corner. This summer seems to be flying past at an unusually fast pace this year. I did manage to slow down just a bit to interview the August Featured Artist – The Unamused Kraken. 1. The Unamused Kraken – Where did this name come from? So a few years ago, I was reading Good Omens by Terry Pratchett and Neil Gaiman, when I came across a paragraph that began with the sentence “The kraken is not amused.” (That paragraph happened to be the only mention of the kraken in the entire book…) I decided that if I ever needed a band name or anything, I would use The Unamused Kraken. 2. When did you start playing the guitar? I started playing guitar about three and a half years ago. I’ve had a lot of varied interests over the years, particularly in artistic endeavors, and music is the one that keeps drawing me in. It’s sort of inescapable, and I enjoy the challenge of working with lyrics, chords, etc., to perfect songs as much as possible. For some reason I feel like I’ve pretty much always thought it would be awesome to play music onstage, and I’ve loved what I’ve been able to do of that thus far. 4. What is your favorite kind of music to perform? For the covers I’ve been putting up on YouTube, I usually go for songs that I know fairly well, especially more random and obscure songs. Otherwise, I tend to go with my original music, now that I’m starting to have a sizable number of songs that I consider relatively finished. I’ve been writing a lot of songs this summer and I’ve especially enjoyed playing them at open mics within a day or two of their creation. It keeps life interesting. 5. When did you start performing at open mic nights? I found one at the end of last summer (at a place that has since closed) that I went to a couple times but mostly it started toward the beginning of this summer. 6. How did you hear about Creative Convergence? Bill invited me the first time I went to the open mic at Sam Ash. 7. Who are your favorite musicians/singers/bands? I have so many… I’ll go with John Denver, Simon and Garfunkel, David Bowie, the Moody Blues, and the Mountain Goats. 8. What inspires you to write and play? I tend to think a lot, so a lot of my songs come from everyday life. But I’m also frequently inspired by nature, especially water. 9. Do you have any plans for releasing The Unamused Kraken on CD? Yep, I’ve been working on an album for the past year and a half and am currently working on finishing that off before the end of the summer. 10. What other instruments do you play? Besides the guitar, I play a little bit of ukulele and a touch of piano. 11. I always ask this one – If you could live anywhere in the world where would you live and why? Pretty much anywhere with both water and trees I guess. Somewhere not too hot. Those are my main criteria. 12. Is music your full time job? Well, right now I’m actually about to go back to college in the fall, so we’ll see on that I guess. I’d love to be able to make it happen though. 13. Not music related but I’m curious – Is Mango your given middle name? I think it’s great by the way. No, it’s actually a nickname: at school I’m part of this group called Dag (short for Dagorhir) that runs around and fights with foam swords. Everyone there has a nickname for use in battles and such, and I chose Mango because mangos are delicious and awesome! 14. Where can we see you play live and in person? This summer I’ve been playing at three different open mic nights: Tuesday nights at 9 at By Golly’s in Milford, Wednesday nights at 6 at Sam Ash by Tri-County Mall, and Thursday nights at 7 at the Plain Folk Cafe in Pleasant Plain. To go to the Art Challenge Gallery site. This blog has some fantastic art and artists showcased upon the web pages therein. Also check out the various pages on the blog for Artist Challenges that you can participate in. These are all themed challenges. Some are free to enter and some have a nominal fee. All works are showcased on the site. you to check it out. Oh yes I did say that and I’ll do it again – Happy Monday. 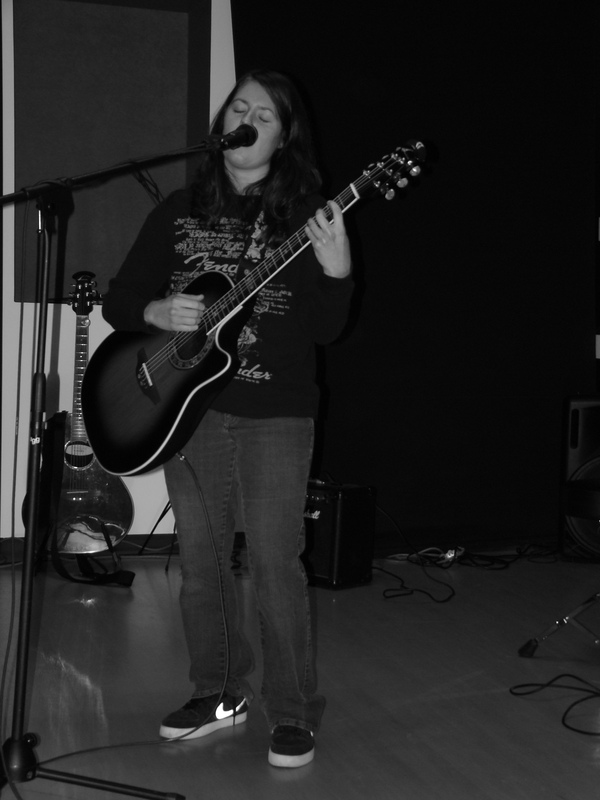 The open mic event on Saturday (7-13-13) was a great success! I had no doubts though because of the outstanding talent always rocks Cincinnati Mall (which I think changed their name to Forest Fair Village, but I’m still checking on that info). If you couldn’t make it this month do not worry, we’ll set if off again in August. 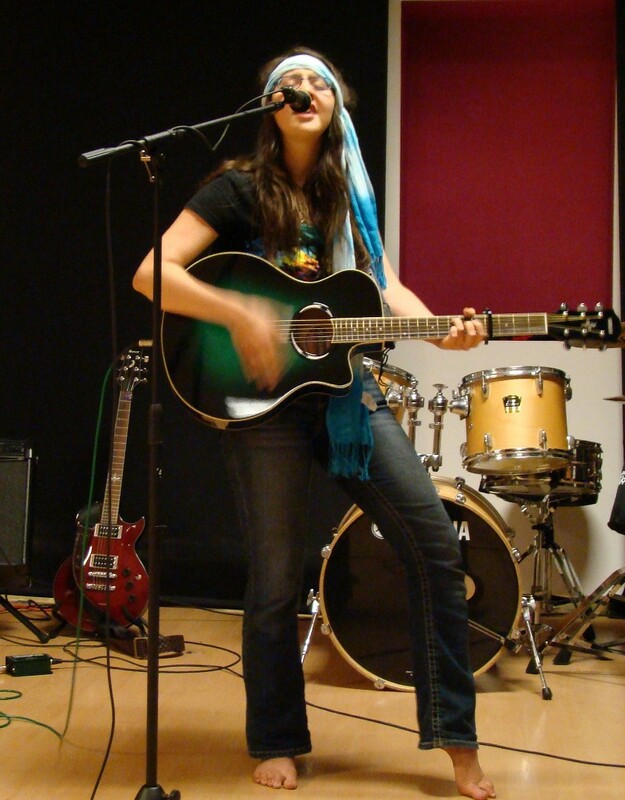 July artist of the month Tajlyn Musi had verily good sets and performed with two other musicians. If you have the chance to see her live – do it! Photos of the event shall be posted here and on our Facebook pages this week. So come on back to check those out and to check our schedule (if you haven’t yet) so you can jot down the info for the upcoming events. 1. How/when did you get started playing the guitar? I started playing guitar when I was eleven. My sister got one for Christmas, but I took more interest in it than she did. 2. Did you always write your own music? 3. Who/what inspires you the most when writing? I get inspired by things like emotions, peoples behavior, surfing, skateboarding, anything really. 4. Where do you see yourself in 3 years? In three years I would like to be living or at least starting a nomadic life traveling the world playing music. 5. How did you hear about Creativa? 6. Do you play any other instruments? I play bass, keys, drums, didgeridoo, doumbek, violin, and banjo. 7. How long does it typically take you to write a song to its completion? So far it’s taken me anywhere from a few weeks to a year to finish a song. I’m looking to break that record. 8. Is anyone else in your family musically inclined? I have cousins who play music as well as my grandparents. 9. Where can people buy your cd’s? 10. If you could live anywhere in the world (without having to worry about money) where would you live? I would live in either Australia, Thailand, or Peru. 11. What your musical goals right now? My musical goals right now are to getting songs finished quicker, playing in new cities/states, and just being a full time musician. Favorite color is orange, music is film compositions (if that’s considered a type of music), food would have to be spinach, it goes with anything. 13. Does your family support you in your musical goals and career? My family supports my musical goals and career. 14. When can we expect your next CD? I hope to start recording my next album within the next twelve months. 15. What is your favorite relaxation technique or habit? My favorite thing to do to relax is to go outside and stare off in the distance with the sun in my face. It seems to work. “Your twenties are your selfish years.” – My mother. I hope these answers will do. I am looking forward to next Saturday. See you there. Poets, singers, guitarists, drummers, storytellers, word smiths, and dancers all grace the stage with their works that bring life to the earth and makes the wind dance with creative energy that flows at this event. If you love to listen to , look at, and experience art in all of it’s forms both wild and tame then this event is for you. Come out to perform or sit back, relax, and enjoy. See you there. Joelle: First – Thank you for the interview When did you start playing music? Sutekh: Well, thanks for asking about me and my music. I started playing when I was young, I come from a musical family…it’s what we do. Joelle: Do you write all of your own material? Sutekh: Now and then I like to spruce up old stuff, but for the most part I’m all original. Joelle: What kind of music do you listen to? Sutekh: Believe it or now I listen to reggae most often than not but anything with some drive sounds good to me. Joelle: Who or What is your biggest musical influence? Sutekh: My dad he taught me everything I know…good and bad. Joelle: Your name is very unique. What does it mean and is it a family name? Sutekh: The origin of my name is Egyptian…I was adopted at birth by a native Syrian family and while it’s not quite pronounced as Seth its the closest way of saying it without spitting on people. Joelle: If you could live anywhere on the planet where would go and why? Sutekh: Wherever the people are getting along without the use of heroin and I can plug-in my amp will be fine to me. Joelle: When did you start performing your own music? Sutekh: I started playing solo after the years of trying in vain to push a punk rock band to popularity. I re-geared and here I am. Joelle: How did you hear about Creativa? Joelle: Where do you see yourself in three years? Sutekh: It’s hard for me to talk future. I have survived cancer and spinal surgery. The fact that I’m here talking to you is a miracle…I live every day like I won’t get another one……three years or three minutes, just know I’m giving it my all. Joelle: Cow Punk isn’t a genre of music that I’m familiar with so, what is Cow Punk? Sutekh: Well cow punk stems from the moment Dylan went electric and didn’t strike again until Social D hit the scene mid 80s… And with the flourishing return of folk music came a cow punk revival with such bands as Drag The River , Two Cow Garage and Lucero. But I put my own spin on it with my semi percussive guitar and unique voice. Joelle: Thanks again Sutekh for talking with me in a virtual kind of way that is, and I’m looking forward to seeing you perform live at Creativa February 9, 2013. Sutekh: You are welcome and I look forward to seeing everyone at Creativa. Come on out to Creativa at Cincinnati Mall on February 9, 2012 to check out Sutekh Dehart and all of the other awesome talent at Creativa. Doors open at 7:00 pm and it all happens starting at 8:00 pm. We are located in Studio 224-B on the second level, next to Burlington Coat Factory. See you there.